The Blucoil Audio Pop filters are designed to attenuate the energy of the plosive, which otherwise might exceed the design input capacity of the microphone, leading to clipping. With a two layer screen that block plosive sounds the Blucoil Audio Pop Filter gives its users double protection. The first screen blocks air blasts as any pop filter normally would. The gap in between then disperses any remaining air pressure, so by the time it passes the second screen, the blast is easily contained. 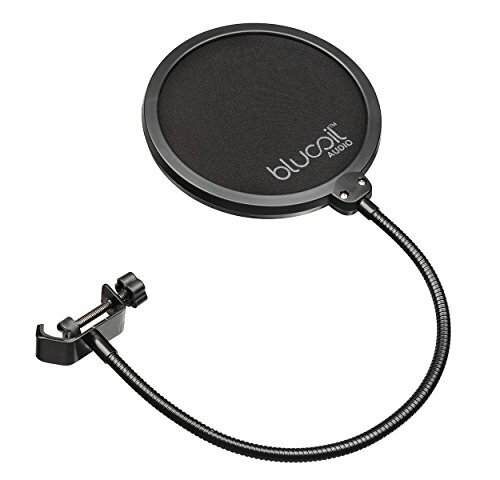 Designed for studio use and other professional vocal recording environments, the Blucoil Audio Pop Filter eliminates 'popping' sounds caused by the impact of fast moving air on the microphone during recorded speech and singing. It also helps protect against the accumulation of saliva on the microphone element. The Blucoil Pop Filter also features a flexible goose-neck holder for easy positioning. The Blucoil Audio Pop filters are a must for professional recording, and if you are serious about quality sound, then you need to have one too. PROTECT YOUR MICROPHONE & RECORDINGS: Protect your recording/singing/speech and keep them clear and audible. The pop filter helps you get rid of the popping, hissing and the plosive sounds that are caused by the 'p', 'b' and 'g' consonants. With this pop filter, you will also protect your mic from dust. FLEX IT FOR THE RIGHT FIT: 360-degree flexible gooseneck holder for precise positioning. The metal gooseneck holder fully supports the filter's weight and helps you easily adjust the angle and distance between the screen and your microphone. UNIVERSAL COMPATIBILITY: Works with all the recording microphones and USB condenser mics including Blue Microphones (Blue Yeti, Snowball iCE, Yeti USB, Snowball USB), Audio Technica (AT2020USB, AT2020, AT2035, AT4040, AT4033/CL, AT4050), Rode, Shure, MXL, sE Electronics, Samson (Meteor Mic, C01U Pro), Sennheiser (e602 II, E609, e904), Innogear, Neewer NW(B-3), NW-700 and many others. LIFETIME WARRANTY: This high-quality microphone pop filter is made to last and comes with a lifetime warranty.